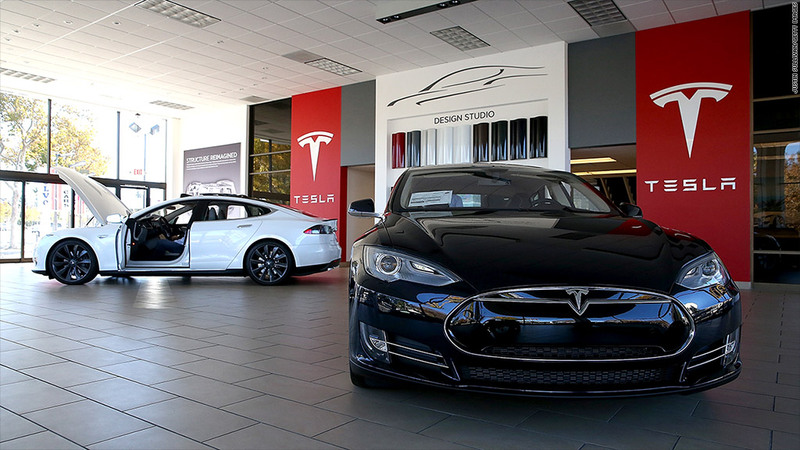 Tesla criticized New Jersey's move to shut down its direct-to-consumer showrooms, like the one shown here in California. Tesla lashed out at New Jersey Governor Chris Christie for backing a proposal that would force the automaker to sell its electric cars through dealers in the state, instead of directly to the consumer. Tesla has been selling directly to shoppers in New Jersey for about a year, having sold 500 cars. But the New Jersey Motor Vehicle Commission is considering a proposal at a meeting in Trenton on Tuesday that would block automakers from selling to consumers. "This is an affront to the very concept of a free market," Tesla Motors (TSLA) said in a blog post on Tuesday. "This new rule, if adopted, would curtail Tesla's sales operations and jeopardize our existing retail licenses in the state," said Tesla's post. "Having previously issued two dealer licenses to Tesla, this regulation would be a complete reversal to the long standing position of NJMVC on Tesla's stores." Christie spokesman Kevin Roberts said New Jersey would press the matter. "Since Tesla first began operating in New Jersey one year ago, it was made clear that the company would need to engage the Legislature on a bill to establish their new direct-sales operations under New Jersey law," he said. "This administration does not find it appropriate to unilaterally change the way cars are sold in New Jersey without legislation," he added, "and Tesla has been aware of this position since the beginning." Christie has the support of Jim Appleton, who is president of the New Jersey Coalition of Automotive Retailers, also known as NJ Car. Appleton said that Tesla never should have been approved to sell cars directly in New Jersey in the first place. "Tesla is a wonderful product but unfortunately the company has chosen an unwise and in New Jersey unlawful distribution method," he said. Appleton explained that dealers protect consumers because "an auto manufacturer is congenitally incapable of fully and faithfully honoring warranty and safety recall obligations." Tesla's practice of selling its Model S electric sedan directly to consumers is unusual, just like the car itself, and has run into problems before. Chief Executive Officer Elon Musk has tangled with dealership associations in various states including Texas and New York. Appleton said that the NJMVC "realize they goofed and they're moving after a year and a half to make sure they don't goof again."